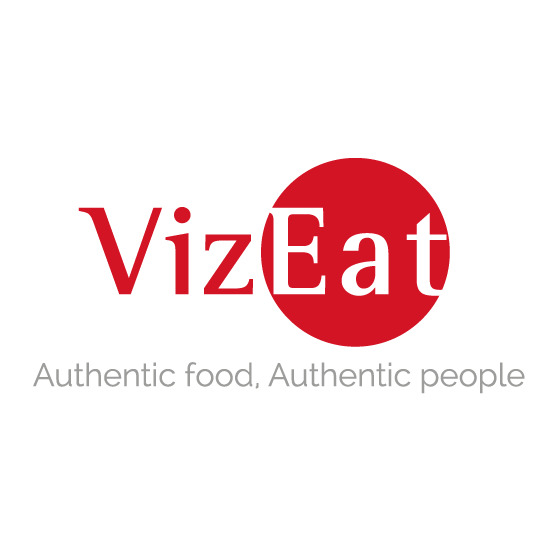 So I don’t know if this post could really hold a candle to my previous post (See Crazy Karate) where I ate a live octopus, but it’s about food that almost everyone around the world loves: ice cream. Whenever I’m traveling to different countries/regions of the USA, I like to see what sort of twists the locals can put on foods that I recognize in order to accommodate local palates. With ice cream in South Korea, it’s no different even when it comes to an American chain that most people would recognize: Baskin Robbins. 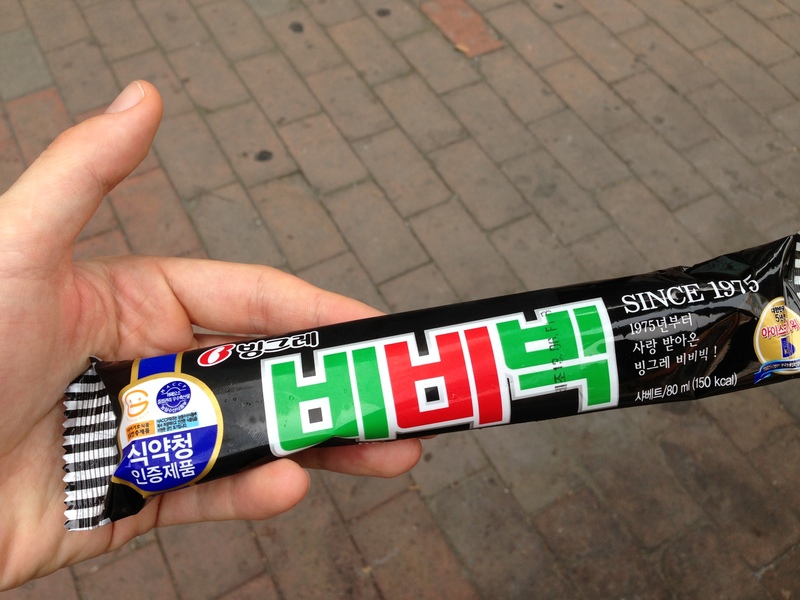 Before I get to some good old-fashioned American ice cream that has been Koreanized, let me quickly mention a purely Korean treat that I tried after going to Jongmyo temple with my friends. I had kept on hearing about the different types of traditional Korean desserts like the ubiquitous rice cake or even 팥빙수 patbingsu which is shaved ice traditionally topped with azuki beans, fruit, and yogurt. I’ve never tried it, but while rummaging through the ice cream bin at the CU convenience store, I stumbled upon a red bean popsicle. Thankfully, it was a 2+1 deal, so I got other flavors as chasers to this red bean one if it was really terrible. 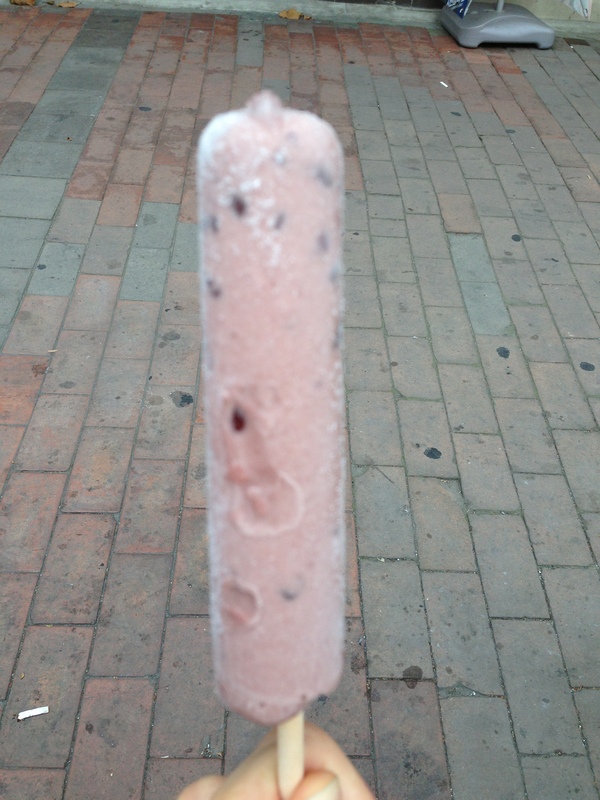 I was glad I did that because this bean-laden ice pop did not beat the unbearable heat and humidity. When I bit into it, I was immediately immersed in a world of whole red beans. The medium in which the beans were suspended didn’t have much flavor, but I was overwhelmed by the savory sweet sensation. It definitely wasn’t a good choice. 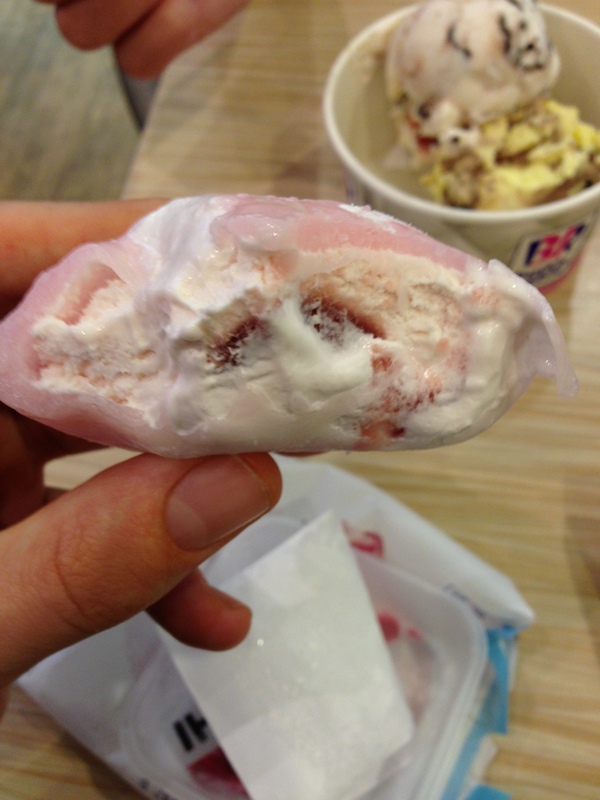 However, Baskin Robbins didn’t disappoint in terms of trying strange new foods. My friend Carolyn and I decided to get dessert after a small dinner, and that naturally led us to Baskin Robbins since she has a major sweet tooth while I’ve never been to one in Korea. I scanned the menu for something beyond the typical cone and cup binary, and my eyes wandered over to the “frozen desserts” section. They were cheaper than ice cream, but the names sounded so odd like “Apogato” and “Honeybread”. Definitely not like the ice cream shops back home. 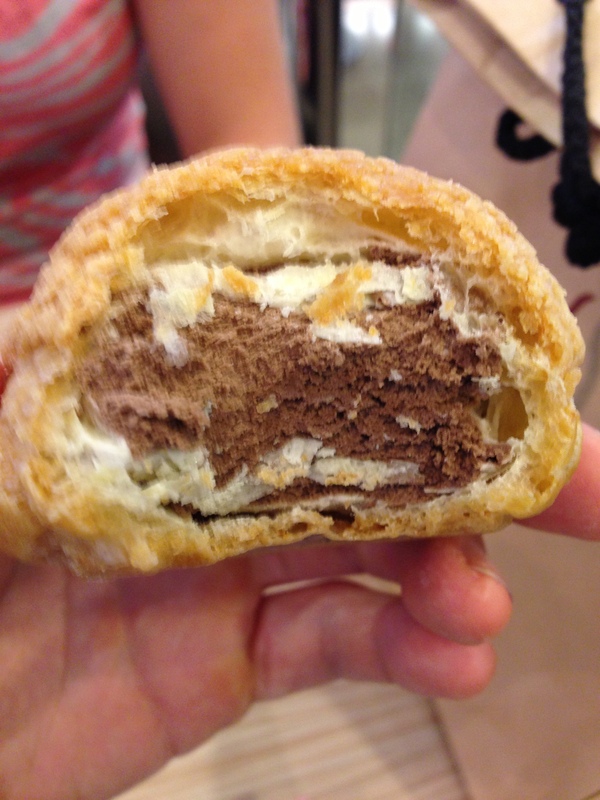 I eventually settled on a snow mochi (2,000 won) and a biscuit choux (2,000 won). I started with the snow mochi since I had already had mochi before. For those who don’t know what mochi is, it’s a type of rice dough similar to Korea’s tteok where it’s quite pliable and has a neutral flavor. I picked up the little pink ice ball and bit into it. 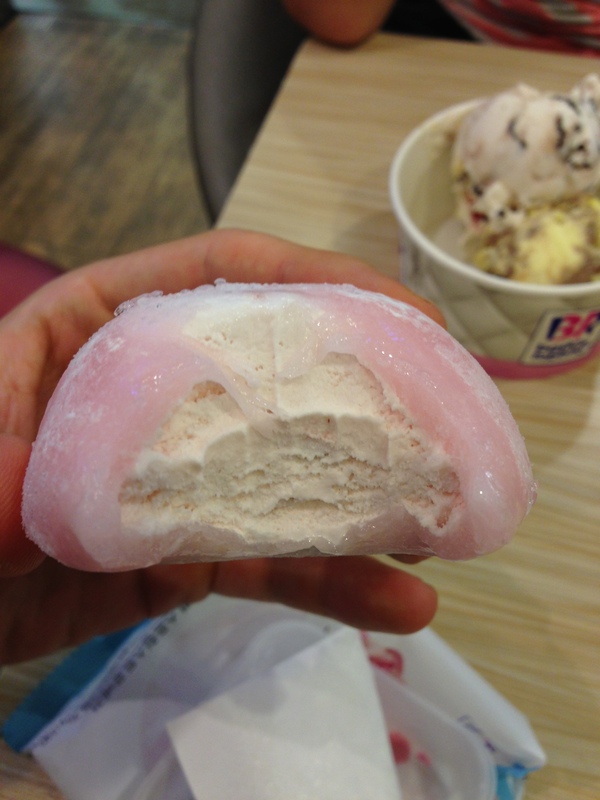 I don’t know what it was, perhaps my love for gummi candy, but the mochi’s rubbery texture combined with the hard, cold ice cream really made me love this small treat. 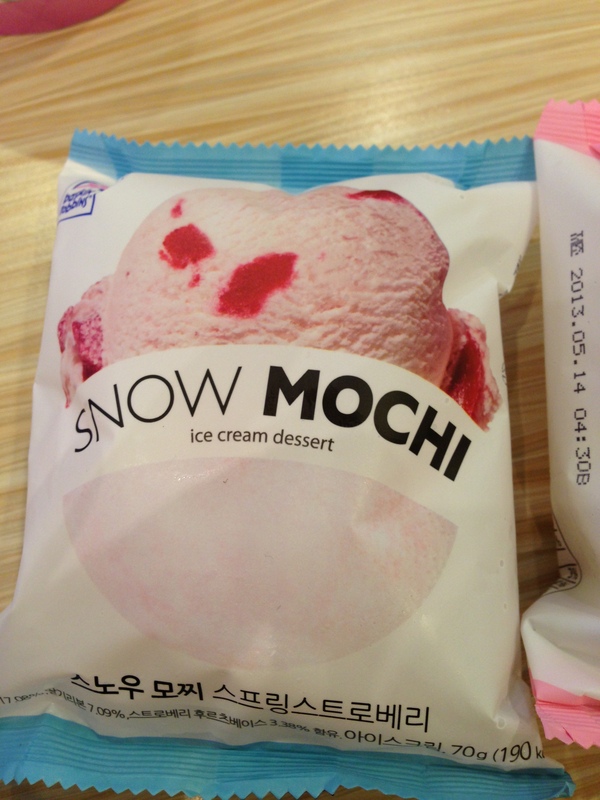 Plus, the mochi was strawberry flavored which resulted in a fruity vanilla swirl that would be hard to beat. 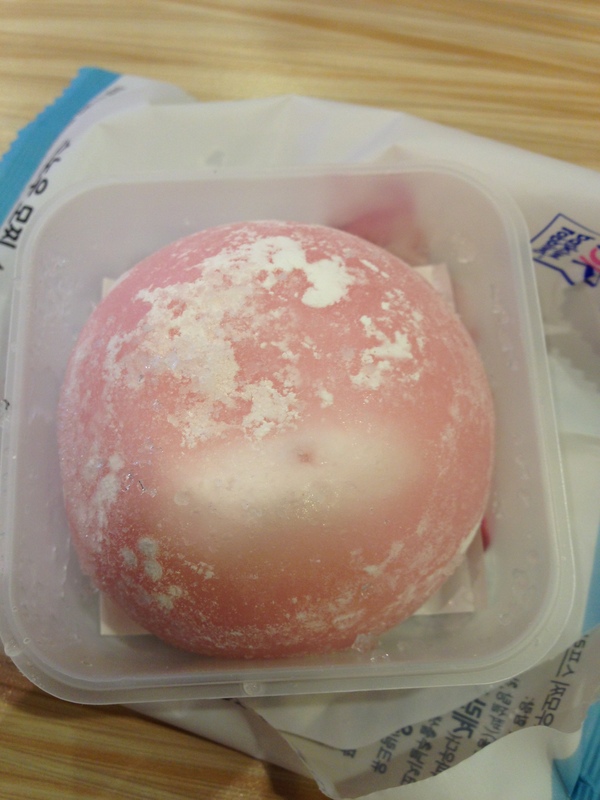 In the center, there was some sort of gelatinous fruit that I assumed was more strawberry paste, but overall, I was quite satisfied with the snow mochi. 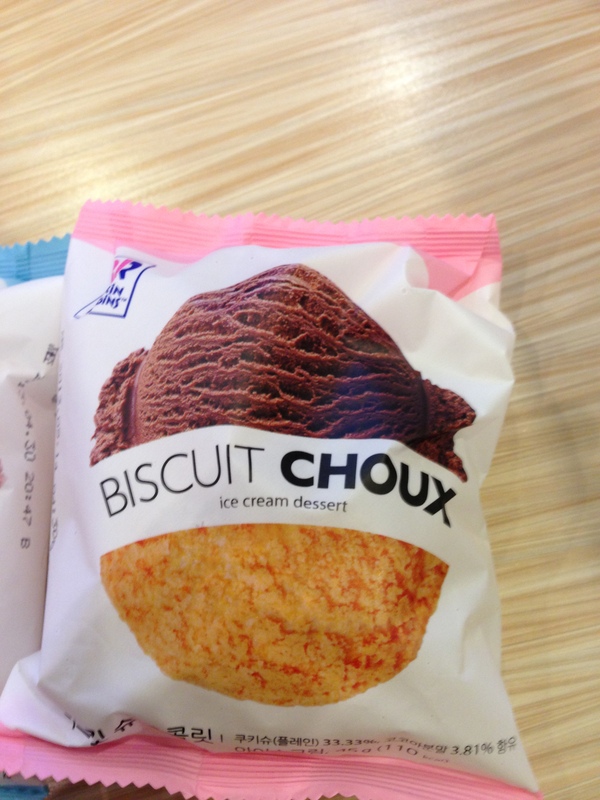 With the bar set high by the snow mochi, the biscuit choux was bound to not live up to the same expectations. While the outside had the same appearance as some sort of dry pastry (choux is the same dough used in eclairs), when I bit into it I was greeted with some chocolate hidden treasure. This was the only bright point of the biscuit choux. The ice cream was great with a rich milk chocolate flavor and high butterfat content, but the pastry was a mere spectator to the show that was our dessert. 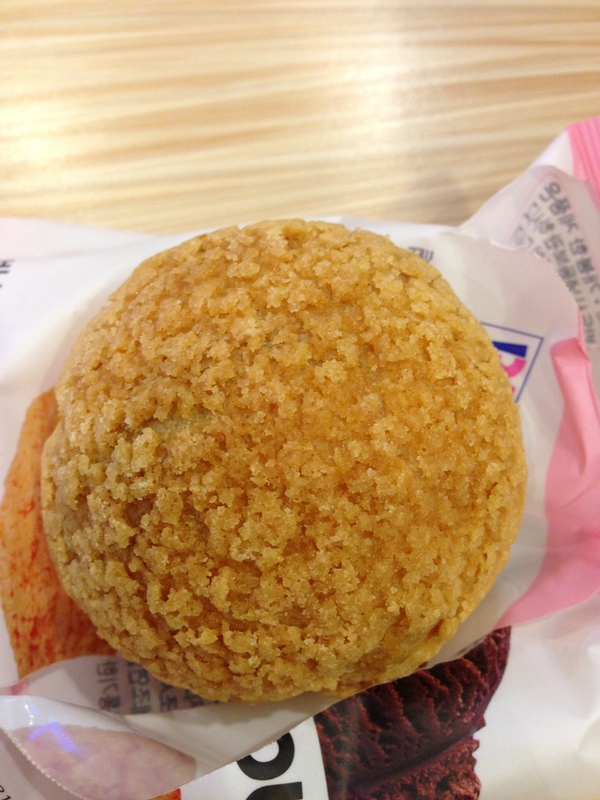 Alas, it was flaky and flavorless. While the mochi was exotic and entertaining like a Cirque du Soleil show, the biscuit felt like this, entertaining but falling a bit flat. Either way, I highly recommend that you try some Baskin Robbins while you’re in Korea if you’re looking for some delicious ice cream. As for the red bean popsicles, I’m going to give them the cold shoulder in the future.